Mathematician, linguist, and editor; born at Wirballen, Russia, 1816; died in London, England, July 22, 1872. At an early age he showed great aptitude for the study of mathematics and languages, and was fortunate in finding a Polish schoolmaster who secretly aided him in acquiring the rudiments of a modern education. In 1839 he emigrated to London. Here he was at first employed as teacher in a Jewish school, at the same time preparing himself for his future career as a mathematician and author. His first work was "Mo'ed Mo'adim," on the Jewish, Karaite, Christian, and Mohammedan calendars, with tables from the Creation to the year six thousand (London, 1846; republished 1863). 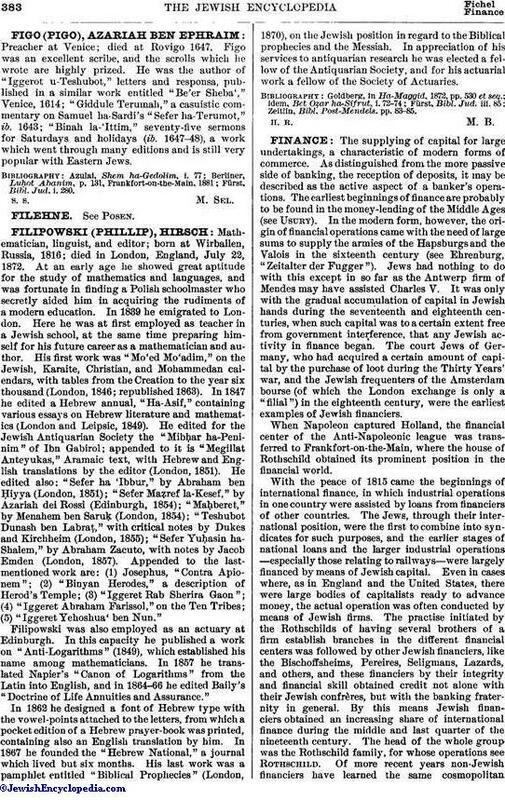 In 1847 he edited a Hebrew annual, "Ha-Asif," containing various essays on Hebrew literature and mathematics (London and Leipsic, 1849). He edited for the Jewish Antiquarian Society the "Mibḥar ha-Peninim" of Ibn Gabirol; appended to it is "Megillat Anteyukas," Aramaic text, with Hebrew and English translations by the editor (London, 1851). He edited also: "Sefer ha 'Ibbur," by Abraham ben Ḥiyya (London, 1851); "Sefer Maẓref la-Kesef," by Azariah dei Rossi (Edinburgh, 1854); "Maḥberet," by Menahem ben Saruḳ (London, 1854); "Teshubot Dunash ben Labraṭ," with critical notes by Dukes and Kirchheim (London, 1855); "Sefer Yuḥasin ha-Shalem," by Abraham Zacuto, with notes by Jacob Emden (London, 1857). Appended to the last-mentioned work are: (1) Josephus, "Contra Apionem"; (2) "Binyan Herodes," a description of Herod's Temple; (3) "Iggeret Rab Sherira Gaon"; (4) "Iggeret Abraham Farissol," on the Ten Tribes; (5) "Iggeret Yehoshua' ben Nun." Filipowski was also employed as an actuary at Edinburgh. In this capacity he published a work on "Anti-Logarithms" (1849), which established his name among mathematicians. In 1857 he translated Napier's "Canon of Logarithms" from the Latin into English, and in 1864-66 he edited Baily's "Doctrine of Life Annuities and Assurance." In 1862 he designed a font of Hebrew type with the vowel-points attached to the letters, from which a pocket edition of a Hebrew prayer-book was printed, containing also an English translation by him. In 1867 he founded the "Hebrew National," a journal which lived but six months. His last work was a pamphlet entitled "Biblical Prophecies " (London, 1870), on the Jewish position in regard to the Biblical prophecies and the Messiah. In appreciation of his services to antiquarian research he was elected a fellow of the Antiquarian Society, and for his actuarial work a fellow of the Society of Actuaries. Zeitlin, Bibl. Post-Mendels. pp. 83-85.